Abba Gelasios trained as an ascetic in Egypt. He became abbot of Nilopolis in the mid-fifth century. He was a scholar and a great abbot, involved both in the ecclesiastical politics of his time and in the law-suits of his monastery. He was a firm supporter of Juvenal, and held to the formularies of Chalcedon. The second story here introduces the famous Saint Symeon the Stylite, on his pillar outside Antioch. Symeon is shown in the important role of arbitrator, to whom secular disputes as well as religious matters were brought in his role as prophet and holy man. Venerable Gelasios reposed in peace. 1. It was said of Abba Gelasios that he had a leather Bible worth eighteen pieces of silver [about $10,000]. In fact it contained the whole of the Old and New Testaments. He had put it in the church so that any of the brethren who wished, could read it. A brother who was a stranger came to see the old man and, seeing the Bible, wished to have it, and stole it as he was leaving. The old man did not run after him to take it from him, although he knew what he was doing. Filled with compunction, he went to find the old man, to do penance and ask him to take his book back. But he did not wish to make good his loss. So the brother said to him, 'If you do not take it back, I shall have no peace.' The old man answered, 'If you won't have any peace, then I will take it back.' So the brother stayed there until his death, edified by the old man's way of life. 2. A cell surrounded by a plot of land had been left to Abba Gelasios by an old man, also a monk, who had his dwelling near Nilopolis. Now a peasant farmer under Batacus, who was then living at Nilopolis in Palestine, went to find Batacus, asking to receive the plot of land, because, according to the law, it ought to return to him. Batacus was a violent man and he tried to take the field from Abba Gelasios by force. But our Abba Gelasios, not wishing that a monastic cell should be ceded to a secular, would not give up the land. Batacus, noticing that Abba Gelasios' beasts of burden were carrying olives from the field that had been left to him, turned them by force from their course and took the olives for himself; scarcely did he return the animals with their drivers, having caused them to suffer outrages. The blessed old man did not reclaim the fruit, but he did not cede possession of the land for the reason we have given above. Furious with him, Batacus, who had other matters to deal with also (for he loved lawsuits), betook himself to Constantinople, making the journey on foot. When he came near to Antioch, where Saint Symeon's fame was shining with great brilliance, he heard tell of him (he was indeed an eminent man) and, as a Christian, he desired to see the saint. 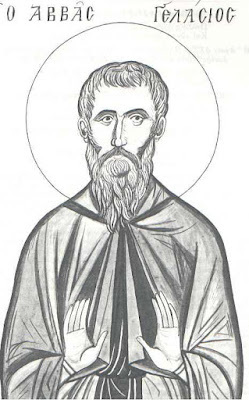 Blessed Symeon, from the top of his column, saw him as soon as he entered the monastery and asked him, 'Where do you come from and where are you going?' He replied, 'I am from Palestine and I am going to Constantinople.' He continued, 'And for what reasons?' Batacus replied, 'About many matters. I hope, thanks to the prayers of your holiness, to return and bow before your holy footprints.' Then Saint Symeon said to him, 'Wretch, you don't want to say that you are going to act against the man of God. But your way is not favorable for you and you will not see your house again. If you will follow my advice, leave these parts and hurry to him and ask his pardon, if you are still alive when you reach that place.' Immediately Batacus was seized with fever. His fellow travelers put him into a litter and he hastened, according to the word of Saint Symeon, to reach Abba Gelasios and to ask his pardon. But when he came to Beirut, he died without seeing his house again, according to the old man's prophecy. It is his son, also called Batacus, who has told this to many trustworthy men, at the same time as he gave the account of his father's death. 3. Many of his disciples used to relate the following also: One day someone had brought them a fish and when it was cooked, the cook took it to the cellarer. An urgent reason obliged him to leave the storeroom. So he left the fish on the ground in a dish, asking a young disciple of Abba Gelasios to look after it for a short while until his return. The boy was seized with desire and began to eat the fish greedily. The cellarer, finding him eating it on his return, was angry with the boy who was sitting on the ground and without being careful about what he did he kicked him. Being struck on a mortal part, by demonic power the boy gave up his spirit and died. The cellarer, overcome with fear, laid him on his own bed, covered him and went to throw himself at Abba Gelasios' feet, telling him what had happened. Gelasios advised him not to speak of it to anyone and ordered him to bring the boy, when everyone had gone to rest in the evening, to the diaconicum, place him before the altar and then to withdraw. Coming to the diaconicum, the old man continued in prayer; at the hour of the night psalmody, when the brethren assembled, the old man withdrew, followed by the little boy. Noone knew what had been done, save he and the cellarer, until his death. 4. Not only his disciples, but many of those who met him, often told this about Abba Gelasios. At the time of the Ecumenical Synod at Chalcedon, Theodosius who had taken the initiative in the schism of Dioscorus in Palestine, foreseeing that the bishops would return to their particular churches (for he was also present at Chalcedon, expelled from his fatherland because his fate was to stir up trouble), hastened to Abba Gelasios in his monastery. He spoke to him, opposing the Synod, saying that the teaching of Nestorius had prevailed. By this means he thought to win over the holy man and bring him to his own delusion and schism. But he, because of the bearing of his interlocutor and the prudence with which God inspired him, understood the injurious nature of his words. Not only did he not join himself to this apostasy, as almost all the others did, but he sent him away covered with reproach. In fact, he made the young child whom he had raised from the dead come into their midst and he spoke thus, with great respect, 'If you want to argue about the faith, you have those close to you who will listen to you and answer you; for my part, I have not time to hear you.' These words filled Theodosius with confusion. Hurriedly he left for the holy city and there got all the monks on his side, under the pretext of fervent zeal. Then, using this as his aid, he seized possession of the throne of Jerusalem. He had prepared the position for himself by assassinations and he did many things contrary to divine law and canonical precept. Having become master and attained his goal, laying hands on many bishops to set them on the thrones of bishops who had not yet retired, he made Abba Gelasios come to him. He invited him into the sanctuary, endeavoring to win him over, even while fearing him. 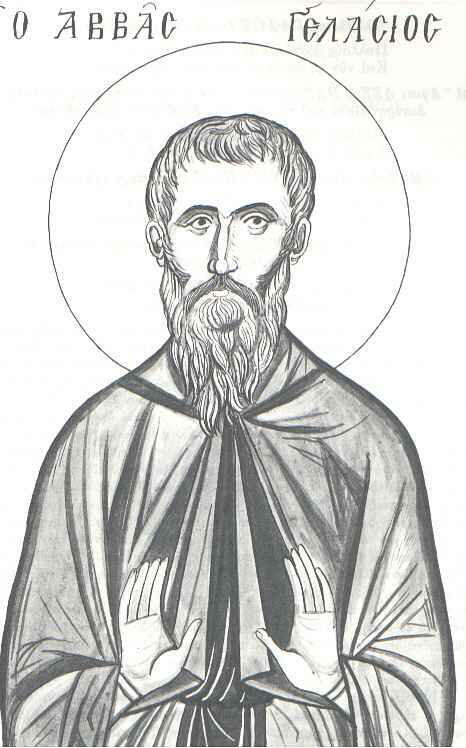 When Gelasios entered the sanctuary, Theodosius said to him, 'Anathematize Juvenal.' But he remained unmoved and replied, 'I do not know any bishop of Jerusalem but Juvenal.' Theodosius, fearing others would imitate his holy zeal, ordered him to be driven out of the church, covering him with ridicule. The schismatics took him and put faggots round him, threatening to burn him. But seeing that even that did not make him give in nor frighten him and fearing a popular rising, for he was very celebrated (all this had been given him by Providence from above), they sent our martyr, who had offered himself as a holocaust to Christ, safe and sound away. 5. It was said of him that in his youth he had led a life of poverty as an anchorite. At that time in the same region there were many other men who, with him, had embraced the same life. Among them there was an old man of very great simplicity and poverty, living in a single cell to the end, although in his old age he had disciples. This old man's particular acts of asceticism had been to guard against having two tunics and till the day of his death not to think of the morrow whilst he was with his companions.